I love weaving narrow bands, and have been hooked on pickup techniques on the inkle for more than 20 years. I loved the workshop so much that I bought Susan’s book, and I highly recommend it – when you click on the blurb link, you’ll still have to type in Sami band weaving. One thing lead to another, and I became obsessed with the double hole rigid heddle. (I drew and burned the bunnies on- it comes without decoration) and then couldn’t figure out how to weave with it. ARGH!!!!! so I just wasn’t willing to give up on it. SO!!! I am THRILLED! that my dogged determination to figure it out has paid off! I am now happily weaving away on the 2 hole rigid heddle loom. And, I decided to make a video so that you can weave on the double hole rigid heddle loom, too! Full of excitement, I made a video, showing what I was doing, but a kind weaver on the Braids and Band group gently pointed out to me that there is a MUCH better way of weaving the bands. So, I went back to my loom, did it the way she said to, and VOILA! I now have beautifully reversible bands with no ugly floats! I have deleted the first WRONG video and have made a new video, showing the much better way of weaving! I love it- the internet wins again- I get to learn a new technique and be mentored by people half a world away! And, then I get to share the learning curve with you! Wheeeee! I am now weaving ONLY with a shuttle, and not inserting my hand into the shed, and I have stopped using a pick up stick. These are the shuttles that I prefer to work with. I made them from old rulers that I found at the thrift shop. Disclaimer: I offer this chronicle of my learning curve with this technique humbly, with the best of intentions, and with a fair amount of delight and excitement at finally being able to weave nifty bands on the double hole rigid heddle loom. NOTE: Many weavers choose to use backstrap looms for narrow band weaving, but I find them too painful for words, so I use my Cricket loom Don’t have the tension set too tightly. You need a little give with the tension. You’ll find the perfect tension on your loom. 1: When you thread the heddle, take all your pattern strands through the upper set of holes. 2: The pattern threads should be heavier than the background holes. I also like to have the weft strands be a little heavier than the background strands. 3: The selvedge strands can be heavier than the background strands of warp, if you wish. 5: It is a really good idea to add extra length to your warp strands for sampling and experimenting. 6: Traditionally, wool is used to weave decorative bands, but I prefer to work with cotton. I use one strand of cotton for the background strands, and 2 strands for the pattern strands, and depending on how beefy I want the selvedges, more than 2 strands of warp for the 2 outside selvedge strands. 7: Each square on the graph paper represents one set of warp strands. I copied out a 15 strand pattern from Susan’s book, but traditional knitting patterns often work really well for band weaving. I clip my pattern to a metal board and use a magnetic strip to keep my place. 8: You will be following the pattern, slipping warp strands onto your shuttle, and will drop the pattern strands below to the bottom of the shed when your grid square is white. The background strands are always woven in every row, forming a tabby weave. When the background strand is dropped, it forms the reverse pattern on the wrong side of the band. Nifty, yes? 9: Look carefully at your pattern to decide if your odd or even rows will be the ‘up’ position of your heddle. The ‘UP’ position (heddle lifted, which brings all the pattern threads to the surface) is the best choice for rows that have the most pattern strands in them. The pattern that I am using in the video happens to have the most pattern threads in the even rows, so I chose to have the ‘Up’ or lifted position be the one I’ll use for the even rows. 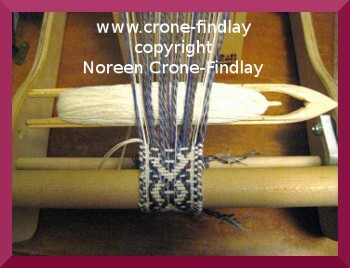 10: Start weaving with the shuttle at the left hand of the band, with Row 1, of the pattern revealed on your chart. Cover the rows above it. 11: The odd rows will have the heddle pushed down. The slot threads are on the surface, and you can see the pattern strands below them. In the photo above, the background threads from the slots, as well as the border strands, are in my hand. The odd rows are lovely to weave. The shed is open – slide the border strands onto the shuttle, then, read the pattern, block by block. If the grid is white, pass the shuttle further into the shed, allowing the background strand to stay on the shuttle, but if the square is colored, pick up the pattern strand and put it on the shuttle. Push the shuttle against the fell line (the last woven row) and tap it to beat it into place. Pull the shuttle all the through, and it is now on the right hand side of the weaving. You are ready to weave an even row. 12: On the even rows, lift up the heddle. The pattern strands pop up to the surface. Read the pattern, block by block. If the grid is white, put the background strand onto the shuttle while passing the tip of the shuttle over the pattern strand, which will push it out of the shed. If it’s colored, move the shuttle through the shed, picking up both the pattern thread, and the background strand that is in the lower hole of the same vertical bar as the pattern thread. And carry on across…. Bring the shuttle to the fell line, and tap it to beat the last row in. Pass the shuttle all the way through and Voila! another woven row! And, here’s the NEW video showing a MUCH BETTER way of weaving with the double hole rigid heddle loom: Happy weaving!!!! 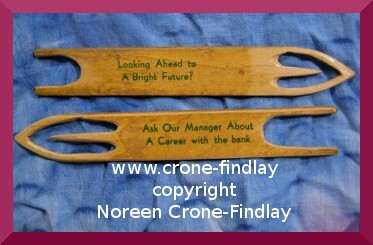 This is wonderful Noreen. You don’t now how many people have asked me about these two-hole heddles. I don’t have one and weave my supplementary warp bands the way I learned here in South America. But I love to be able to help when the question comes up and now I know the perfect place to send people. Thank you for this great post. Hi, Noreen. I bought one of those heddles from Grace several years ago and have never used it. The holes are so tiny that I was afraid I’d have to use sewing thread to weave with, and my courage failed me. 🙂 I have to think that I saw an article in Pieceworks magazine about using them or I would never have purchased one. Have you had time to look thru the indexes of years old (say 1990s) Pieceworks? I haven’t been getting Piecework for that long, but I would also love to see the article. I linked to your etsy shop in my blog entry, but didn’t remember to link to your weavezine article, so thank you so much for including it! It was your Weavezine article that got me excited about double hole weaving- although it took me 11 months to figure it out, LOL!!! That’s okay, as I am now totally hooked on it. I need another heddle, as I tend to put really long warps on, so my first one is going to be busy for awhile. Luckily, the Cricket loom is so portable that I can take it with me when I need to. I use a floss threader to thread the warp strands. The holes are small, but beautifully sanded, so they don’t snag the yarn. 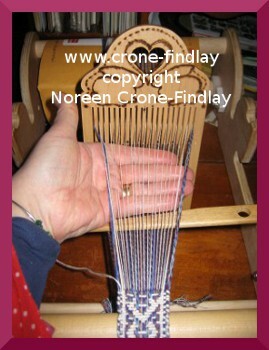 I bought my heddle from Grace Hatton after I saw her article on Weavezine. Wow, this is a beautiful video! Really well done, and not at all “excruciatingly slow”!! It’s perfect, just the right pace and very clear. I wish my videos were this good. i am bookmarking this. A beautiful band, too–love it.Thanks so much. I am so glad that you commented, because I went to look at your blog and am dazzled by your work! I am going to have to spend some time learning the awesome technique that you teach- WOW! Great video! Love the idea of using the Cricket along with the double hole! Beautiful band you are making! Can you PLEASE share with me where I can get this loom (or one like it)? and I used my Cricket loom as the loom to hold the double hole rigid heddle. It’s a very happy combination!